The start of a New Year is often a time to reflect on the past and make resolutions to improve in the future. An ever going epidemic in the United States is drug abuse. Drug overdoses are currently the leading cause of death among Americans under the age of fifty. Research in 2017 has indicated that trends in drug abuse and overdose death rates are at an all-time high. 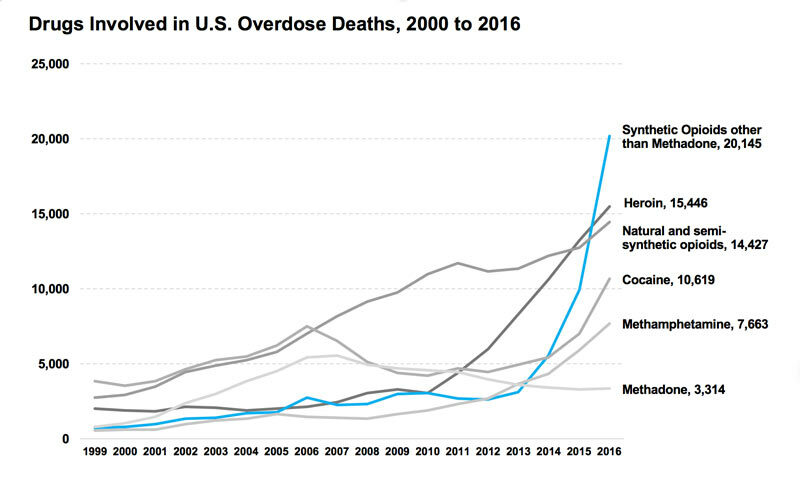 With more than 64,000 drug overdose deaths estimated in 2016, the sharpest increase occurred among deaths related to synthetic opioids with over 20,000 overdose deaths. Although there are delays in toxicology reports and inconsistencies in reported data, it is nevertheless clear that drug abuse and overdose are problems of exceptional and imminent importance. The question, now, is what does this mean for 2018? Goals moving forward involve prevention, rehabilitation, and education for people across the county. These encompass both health and legal objectives, as they are very much intertwined, and addressing the drug epidemic will keep people safer, healthier, and also out of the criminal justice system. Health objectives include medical advancements as well as treatment. There have been many medical advances in the war against opioid overdose, including the FDA approval of Naloxone, designed to rapidly reverse opioid overdose. While paramedics and specially trained responders typically administer Naloxone via injection, there are also nasal sprays and other forms of medicine that are more accessible to the general population. While the problem of drug abuse needs to be tackled starting with prevention, advances such as these are extremely important for rehabilitation purposes for people that struggle with substance abuse and addiction. It also can immediately save lives in grave situations. Along with scientific medical advancements like Naloxone, research has shown that drug abuse treatment can help people with the many aspects and consequences of drug abuse. Drug abuse is very much tied to both legal and health problems. Treatment targeted towards individuals in the criminal justice system can help alter their outlooks and actions toward drug use, avoid relapse, and positively disconnect themselves from a life of substance use and crime. Treatment can be effective, whether voluntary or ordered by the court. There are many places and organizations dedicated to drug abuse rehabilitation and prevention. Programs like Narconon International are devoted to education to prevent drug abuse and addiction, specifically targeting youth. They point to the fact that in today’s society, we are inundated with media and celebrities and influences constantly. Educating youths who are vulnerable to these messages and influences is vital to prevention. Reaching out to young people can help to combat the perpetual abuse cycles that we see in both the health world and the criminal justice world. The 2018 National Rx Drug Abuse and Heroin Summit will take place this year in Atlanta, Georgia in April. The National Rx Drug Abuse and Heroin Summit is a congregation of experts from local, state, and federal agencies, businesses, academia, treatment providers, and allied communities impacted by prescription drug abuse and heroin use. This annual gathering offers an opportunity to discover what is effective in deterrence and healing. It is very clear that drug abuse prevention is a top priority for our country as we ring in this New Year. For more resources and information about drugs, drug abuse, and prevention, please visit and share the 2017 version of the DEA Resource Guide, Easy-to-Read DrugFacts, and The Science of Drug Use – Discussion Points.